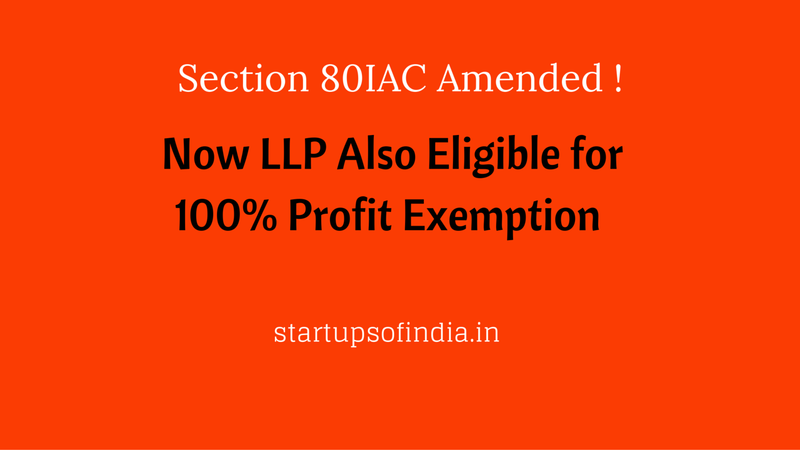 Good News : LLP is also Eligible Startup. Section 80IAC Amended ! Finance Bill 2016 has been passed by Lok Sabha ( Lower House ) and has moved to Rajya Sabha ( Upper House) for debate and ratification . Since it is money bill, one should take for granted that whatever is passed by Lok Sabha will also be passed in Rajya Sabha. So , here is one good news for startups owners. The amended Finance Bill 2016 has brought in amendment to Income Tax Act under which LLP has also been granted the tax profit exemption . Readers may already be aware that the original Finance Bill, 2016 proposed a new section 80-IAC of the Income Tax Act to provide 100 percent deduction for 3 consecutive assessment years to an 'eligible Start-up' engaged in an eligible business. But the definition of eligible startup was missing the word "Limited Liability Partnership ". (iii) ‘‘limited liability partnership’’ means a partnership referred to in clause (n) of sub-section (1) of section (2) of the Limited Liability Partnership Act, 2008.’. 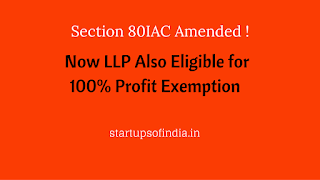 (a) it is incorporated on or after the 1st day of April, 2016 but before the 1st day of April, 2019; Insertion of new section 80-IAC. Special provision in respect of specified business.